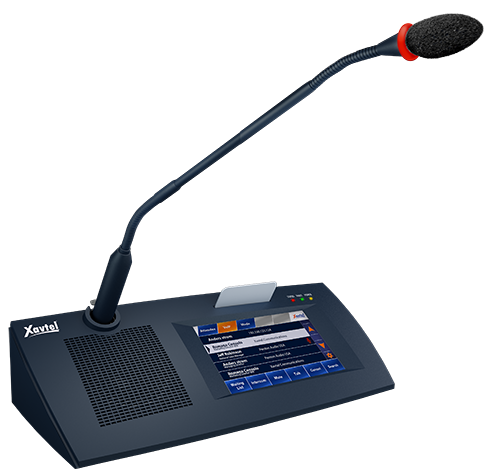 The CDM-T5 Desktop Chairman Delegate comes with 5" LCD touch screen, a built-in loudspeaker, XLR connection for the Xavtel's gooseneck microphones, the mic is available in different length, and also includes the connection for an external headset. The CDM-T5 allows for the full system control of the Senator System, from the capability of volumes changes, settings, paging and dialing if used in a distance or web-conference. The CDM-T5 has a mini USB connector, allowing for an easy-to-setup webconferencing system with the use of optional AEC-Card of DCP1000 for a direct connection to any PC/Laptop. This unique feature allows every standard conference to become either a distance conferencing or a web conferencing system at the same time. No more integration or extra cabling of the system will be needed!